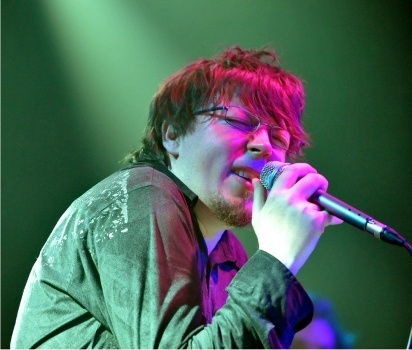 On March 27, the Norwegian post rock band Gazpacho appeared in Zoetermeer for a headline show. Although the balcony was closed, the main hall was filled pretty well, so not bad at all for a relatively unknown act. The set up on the stage was straight forward, no fancy extras, just the instruments, a projection screen and the impressive lighting facilities from De Boerderij. Equally plain and simple, the six guys in the band showed up in quite ordinary clothes but they obviously were fully concentrated on the music. The band played an extensive set, starting the show with Desert Flight, The Walk and the title track from their latest album Tick Tock. Extraordinary atmosphere characterizes this group of musicians because everything they do is supporting melodies sung by lead vocalist Jan Henrik Ohme. 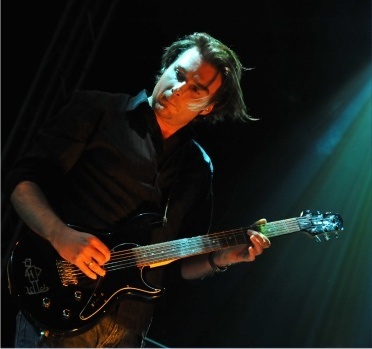 His remarkable voices comes close to Marillion�s Steve Hogarth when he is singing softly at his utmost emotional concentration. No showing off by the instrumentalists, not even by violinist/guitarist Mikael Kr�mer, who stood in the spotlights more than once but never changed his concentrated and modest way of playing. One of the most special songs must have been the title track of their 2004 release When Earth Lets Go, they never performed this song live until this evening! Then the complete album Night was played, except for the song Valerie�s Friend. Sometimes it felt like this band should have been playing at a fireplace in front of people sitting down. The crowd was fully enchanted by the beautiful music and no screams, shouts or just gibberish could be heard, not even during the utmost ambient/acoustic passages. The album Tick Tock, being an absolute winner (look at the RTR review elsewhere on this site), was played in its entirety, so a better choice couldn�t have been made. As encores there was another track from When Earth Lets Go, the opening track of this album as a matter of fact, Snowman, followed by the superb Tick Tock track Winter Is Never. Another encore on demand of all the fans present concluding this first show of Gazpacho tour through Europe was Bravo, the title track of their debut album. Gazpacho is on the verge of international recognition and were living proof of their unusual place in the music-scene by rendering this delightful performance. It�s wonderful that atmospheric music without too much display of individual craftsmanship is still possible these days!